OK Today's flashback will be kind of short...I might be able to write more later. Today was Kaleb, Christopher and Kayleah's first day of school. I have been bawling all morning! It's just so hard to see them grow up and go back to school. I have really loved having all of them home for the summer. We've had so much fun. I really can't believe how much they've grown up. Sarah also starts Kindergarten here after screening and then I'm really in for a hard day! 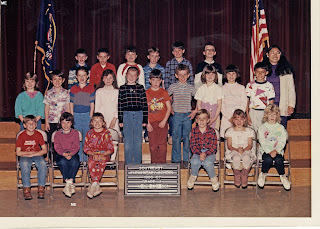 I don't remember much of Kindergarten except that I got to take a towel in to rest on and I thought that was great. Only I don't remember "resting" much. I wasn't one for quiet non-social time...I'm sure some of you are just having a hard time imagining that *wink*. The only other thing I can remember about Kindergarten was some kids making fun of the birthmark I use to have on my left hand. Some said it looked like a bug, other said it looked like chocolate. The chocolate comments weren't so bad, I wasn't fond of the bug ones though. You were so adorable!! That flashback was so fun- I was thinking of doing the same sort of post in a few weeks- so thanks for the cute reminders!! 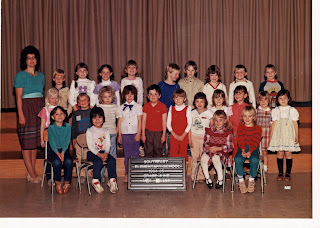 I so loved all the class pictures too- you have far more memories of grade school than I do- they were so fun to read about! Aw. You look so cute! I can't believe your kids have started already! That's really early. And I'll say it again: I love your Flashback Fridays! HAHA I always get a kick looking at really young photos of myself. 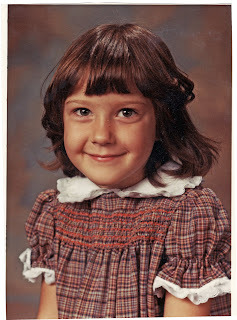 Sometimes I just can't believe I wore "that outfit" or did my hair in "that style"!